Mary P. and I live in Ottawa, Canada’s capital city. Our home is only half a block from the Rideau River, so we spend a lot of time walking beside the water. 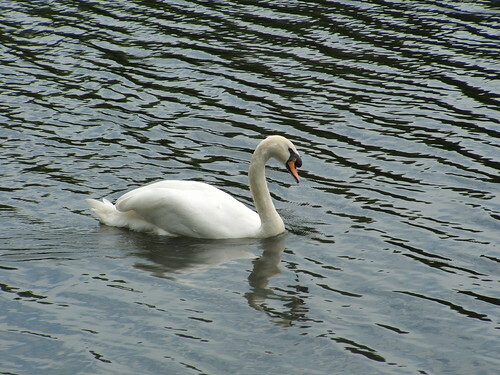 Among other attractions, the Rideau River is home to several pairs of swans during the summer months. Below are some photos I have taken of the swans this summer. The text comes from the City of Ottawa Web site. In 1967, Her Majesty Queen Elizabeth II gifted the City of Ottawa, Canada’s capital, with six pairs of Mute (Royal) swans. Her Majesty’s gift was in celebration of Canada’s 100th birthday. 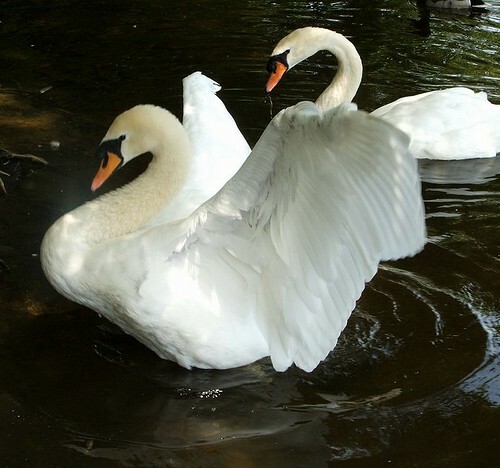 Each pair of swans has it own “favourite” area where it lives for the spring and summer months. Swans prefer to nest in private areas that are surrounded by tall grass or brush and that are not easily accessible to predators and people. They want to protect their cygnets, or brood, from harm. 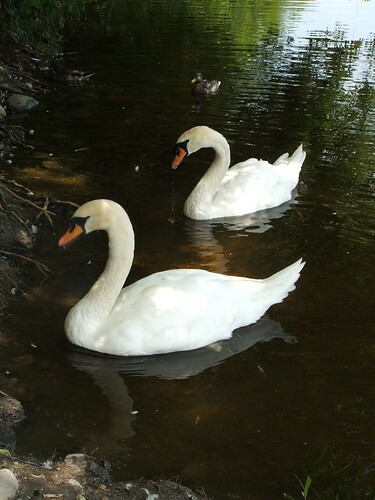 The swans are removed from the River in the Fall – late October or early November – to live in what is fondly known as the “Swan House”, located at the City’s Leitrim Nursery, until May, or so, of the following year. There, each pair of swans has its own indoor pen with a resting area and a swimming pool, and its own outdoor pen. The swans enjoy the outdoors, even in winter. They must be wintered off the River not because of the cold but, because there is not enough open water, which they require in order to sift their food. While on the Rideau River, the swans eat the plants that grow in and around the River. They are often fed bread and other “people food” by well-meaning citizens but, “greens” such as lettuce, spinach and alfalfa sprouts are much better for them. 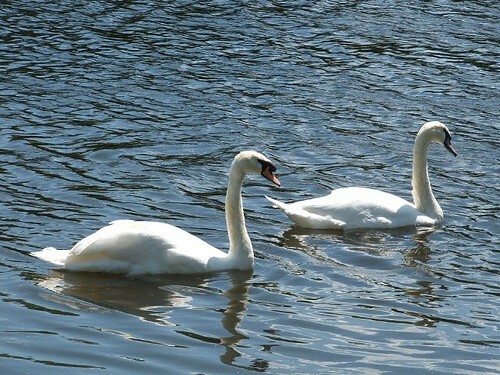 The swans must compete for food with ducks, gulls and other birds while on the River. The swans’ winter diet is quite different from their summer diet because they cannot forage for naturally-occurring plant material in their winter home. There, they are fed a grain-based ration called “Duck Grower” and are provided “greens”, like lettuce, each day. It is not safe to touch the swans. Even though they cannot fly, they are in a semi-wild state and it is best that people enjoy them from a distance just as one would any other wild animal or bird. The City’s swans cannot fly because they are pinioned, meaning that the primary feathers of one wing have been permanently clipped. The primary feathers are the long feathers furthest from the bird’s body without which a bird cannot fly. The Canadian Wildlife Service requires that the swans be pinioned so that they do not migrate and disturb other North American bird populations. That the swans are pinioned is also one of the reasons that they must be removed from the River for the winter as they cannot fly south like other migratory birds. How long do swans live? Swans can live for over thirty years if they are well cared for. Their most common predators are uncontrolled dogs, raccoons, and fox. Large fish and snapping turtles may prey on very young swans. Much like Canada geese, the swans use their very strong wings to fend off unwelcome visitors. Swans mate for life but, may accept a new mate if the other dies. They live for 30 years? Good lord, that’s a long time for a bird! For those who have never been up close to a swan, they are impressively large and they can be quite aggressive. We’re used to birds flying away from us, but these beautiful creatures will come after you. Mary P. prudently keeps her daycare children at a safe distance. But that’s wildlife: beautiful and terrifying in approximately equal measure. As you know, Haley, it’s seagulls that give me nightmares! What I would like to know is what happens to the cygnets that are born each year. The population on the river stays stable – two or three nesting pairs on our stretch of it – so where do the babies go? And what happened to the pair of black swans that were there last year? They prefer spinach to the crackers we’ve been feeding them?? The daycare kids will LOVE that: the tots would happily dine on the crackers and feed that *%@# greenery I keep foisting on them to the birds. Ha! I don’t think I’ve ever seen a baby. I didn’t think our swans reproduced. I vaguely remember seeing babies, but only one year. It’s a mystery! Then again, it makes sense. I feel as though I was dimly aware of it the whole time. • I feel as though I was dimly aware of it the whole time. For the benefit of those who don’t follow the intensely philosophical discussions on Snaars’ blog, I should explain that it was an in joke. Lovely pictures and interesting information, particularly the part about their natural aggression.